The 2010 Santa Rosa Marathon marked a very important running rite of passage for me. It was at this race last year that I qualified for Marathon Maniacs. If you had told me five years ago that I would join a club where people run 26.2 miles weekend after weekend, I would have urged you to consult a psychiatrist. Well, maybe I should be the one making that appointment. 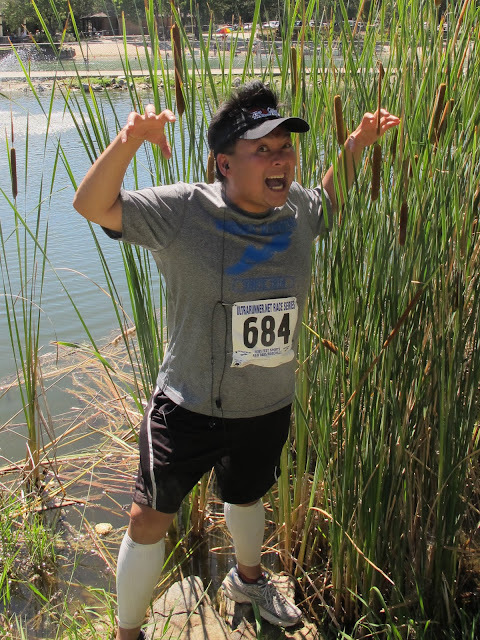 Immediately after crossing that finish line, I registered for Maniac membership. Within a few hours, I received my credentials, MM #2810, and two days later I got my singlet in the mail. 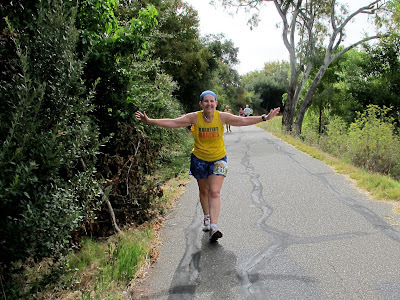 My first marathon was supposed to have been my one and done bucket list race, but that little thing called endorphins made me come back for more. That qualifying race in Santa Rosa was not easy, and I had to work hard to cross that finish line. For this reason, I was determined to return for round two and beat my time! Hence, I showed up incognito, sans cape, so I could get the job done. Sadly, I was not able to beat my 6:45 time from last year. After running a half marathon the day before, my legs just couldn't do it. Once I realized that a PR was not in cards, I slowed down, had some fun, and greeted all the Marathon Maniacs who passed me. I tried to dip. Really, I did try. There's Marathon Maniac Cyndie Merten! Bill McCarty is running without an arm sling this time. Asian Gangsta and Asian Pop Star! Things heated up at about mile 21 when the race director biked out to see how we were doing. He rode up to me and said that the timing folks were going to leave at 2pm, and if Ultra Woof and I couldn't make it to the finish line by then, we would get a DNF. He did inform us that he would save a medal for us though. I was stunned. A medal means nothing without a finish time! I plead my case to him stating that I had all my miles recorded on my Garmin, and asked if the timing folks would take my finish time manually. I panicked! I really needed this marathon, and if I had received the DNF, the Titanium would have hit another ice berg! I plead and plead and the race director said he would see what he could do. With that, I picked up the pace and did my best to get to that finish line! Believe me, I was stressed out. I plugged along, under the scorching sun, battling blisters and cramps. I just couldn't run any more and my legs were so shot that I couldn't even power walk. Nonetheless, I kept going. Flashbacks of last year's race haunted me. Nonetheless, I kept one foot in front of the other. After seven hours and 15 minutes on the course Ultra Woof and I crossed the finish line, fifteen minutes after the cut off time. Fortunately, the timing folks were still there and they took down our finish times manually! I let out a huge sigh of relief and then dropped to the ground! These close calls are always nerve-wracking, but the sweet victory is always oh so nice! A finish is a finish. I got my medal and my finish time. Woo Hoo! Thank you Ernie for cheering us in at the finish line! 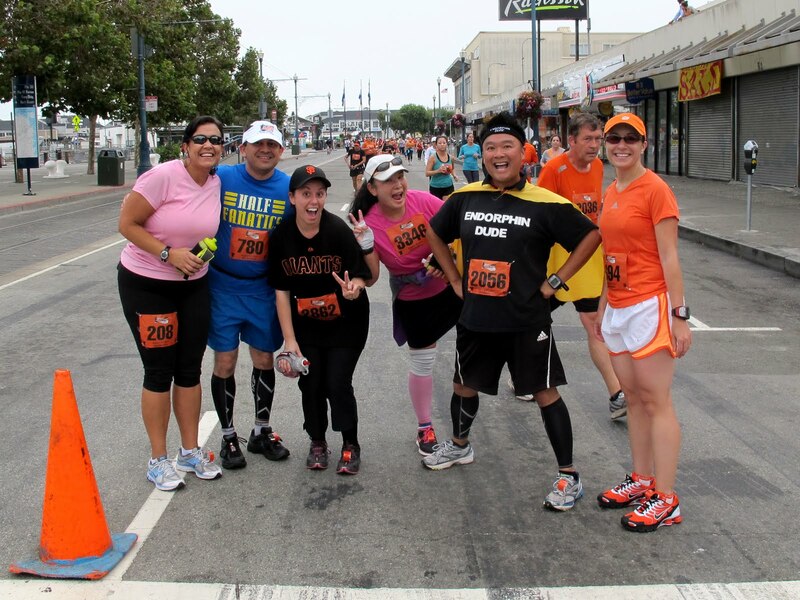 Chewbacca's other doggie nanny, Kristen, and friends were there at the finish line! Thanks Kristen and Vincent, and Cappy too! Here I am with race director Arthur Webb. This guys is a Badwater legend, having run that crazy sauna ultra race so many times that you'd have to use both your fingers and toes to count them! Finishing any race is a big deal, and crossing the finish line at Santa Rosa was sweet success for me. Last year I ran my 3rd marathon here, so returning for #33 one year later marked an important mile stone. I earned my Marathon Maniacs credentials here, so today I celebrated my first birthday in the Insane Asylum. This race also puts me at the half way point in my Titanium quest. I am confident that I will reach my lofty goal of 52 marathons in 52 weeks. It won't be easy, but I'll get there. I am healthy, injury free, and mentally tough. By the end of 2011, there will be 10 stars after my name! Titanium Scoreboard: 26 Down, 26 To Go! Half Way, Baby!!!! 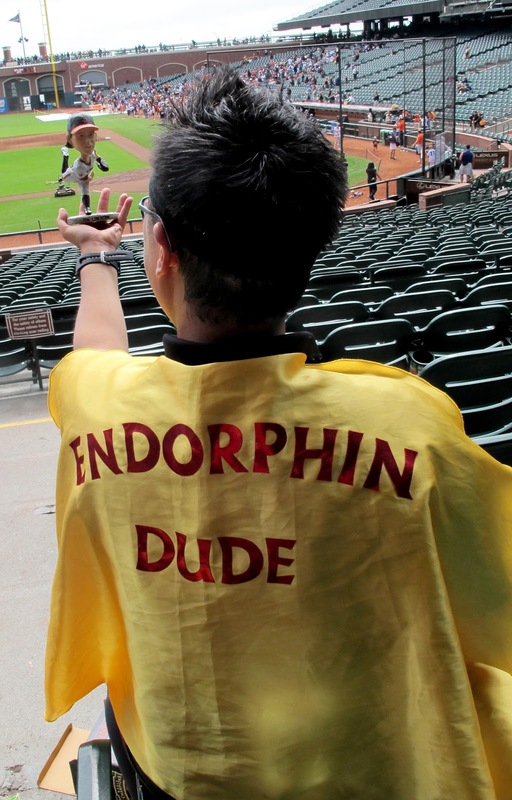 You're probably asking yourself right now, "Gee, why would Endorphin Dude run a half marathon when he's trying to hit Titanium?" In my pursuit of 52 marathons in 52 weeks, it would seem counterproductive to run a 13.1 miler, but I had to do it. How could I not? 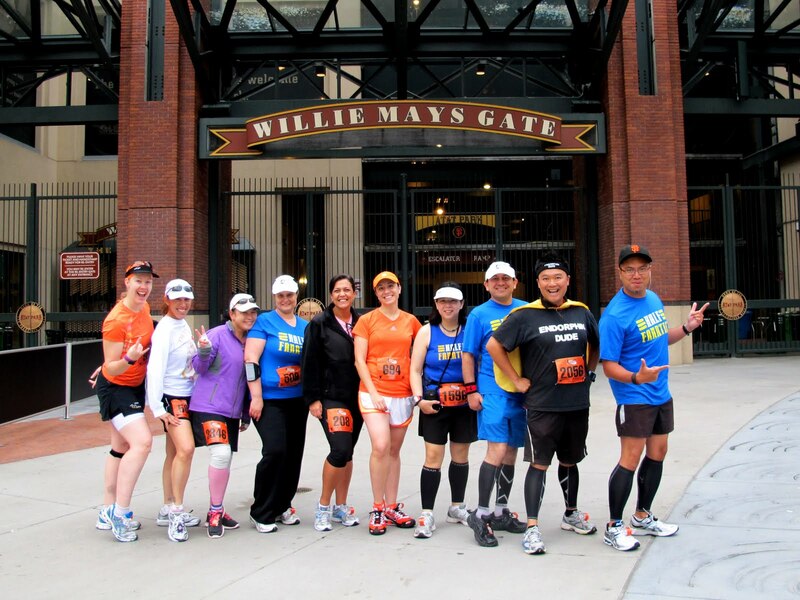 This race runs along the Embarcadero in San Francisco, The Giants are the World Champions, and we get to take home a Tim Lincecum bobble head! Win. Win. Win. I ran the Giant Race last year and absolutely loved it. I had to return for round two. When I ran it last year, I only knew one person who ran it too. 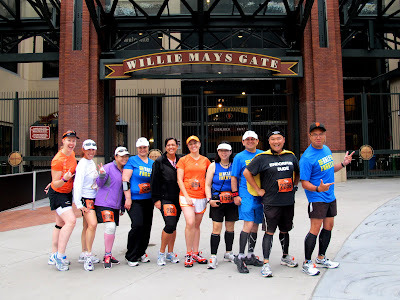 This year, I had my whole Half Fanatic clan and a few Marathon Maniacs. 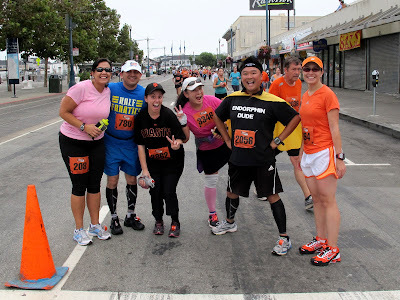 There were also a bunch of my DSE running peeps out there too. Running is a solitary sport, but somehow Endorphin Dude always turns it into one big parade. I think we were about to do the can can. Why? Because we can can! Because of the three hour time limit, I knew I couldn't drag out this race like I did at the Salinas Half Marathon a few weeks earlier. That didn't mean that I couldn't have any fun! Along with my running partner in crime, Ultra Woof, I got to run with my buddy Mohan and newly minted Marathon Maniac, Andi. Here's the funny thing about Andi: she saw Endorphin Dude in the parking lot before the race and said that she was going to drop down to the 5k. She just wasn't feeling it. I told her to stick with the marathon caped crusader and Ultra Woof and we'll be sure that she will cross that finish line. Sure enough, Andi ran with us for the duration of the 13.1 miles. There was only one time when she fell behind us, and that was when she and Mohan stopped for a bio break at Crissy Field. I remember shouting to The Mo: "DUDE! You're properly equipped to use nature's port-o-potty, what the heck are you doing waiting in line?!" All he could do was flash an awkward smile. In any case, these two caught up with Woofie and E-Dude along with a few other Half Fanatics, and together we ran the rest of the way. Some got ahead, others fell behind, but for the most part, we all finished within 5 minutes of each other. Chris Bliss flew out with the elites! The first Endorphin Dudette! I finally got to meet Row! The Pink Girls, Virginia and Woofie. Yeah, we stop in the middle of races to take pics. One of the highlights of the day: Brian Wilson!! Another Endorphin Dudette! It's Elizabeth! Action shot of Half Fanatic, Cassandra. Heading into the finish line. Woo Hoo! I am happy to say that I finished this race under three hours! This is my first sub-3 race of 2011, which is really nice. My half marathon PR is 2:11, which I earned at the 2009 Eye-Q Two Cities Half Marathon, my second 13.1 miler ever. In 39 tries after, I have not been able to shatter that record, and these days, I don't even come close. Back then, I was focused on speed and getting the best time I possible could. These days, I'm out there on the course to have fun. In any case, when I crossed the finish line, Ultra Woof informed me that there were no more medals. Yes, it did bum me out when I learned that I wouldn't have a shiny piece of bling hanging around my neck, but at the end of the day, the thrill of this race canceled out any disappointment of not receiving that medal. 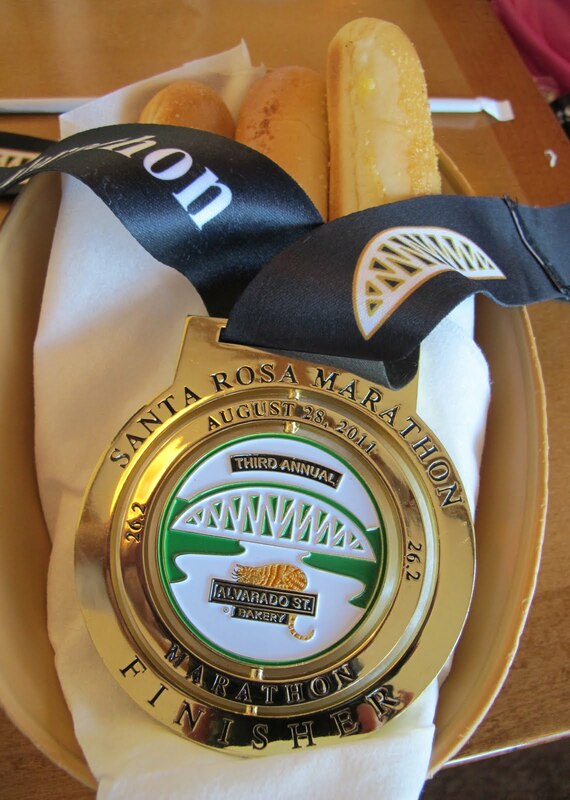 The race directors did inform us that the medals would be mailed, so I had nothing to worry about. 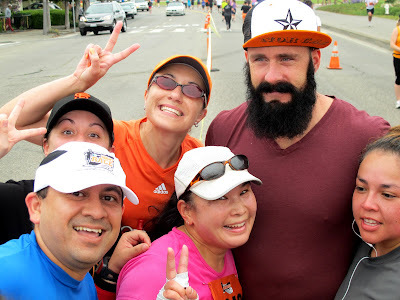 So even though my neck was naked post race, I did get to run with people I dig, I got to high five Brian Wilson, I scored my first sub-3 finish of the year, I got a really cool Tim Lincecum bobble head, and I completed my 41st life time half marathon. Win. Win. Win. Win. Win. The name Run-de-Vous loosely translated means YOUR RUN. This is truly YOUR run. If you wish to race it, do so! If you wish to celebrate a loved one or someone who influenced you to become the person you are today, do so! Need special drinks? You've got them! Need special food during the race? Ask and you shall receive. I asked for a sign, and I got it. How can you not ♥ Run-de-Vous? How could you not run a race with that description? The best part is that every word is true. Rajeev Patel is an amazing race director who just wants to give back to the community, and he did so in a huge way with Run-de-Vous. I had previously run Rajeev's Ruth Anderson Ultra Races 50k and was very impressed, so I had to return for Run-de-Vous. I was not disappointed! 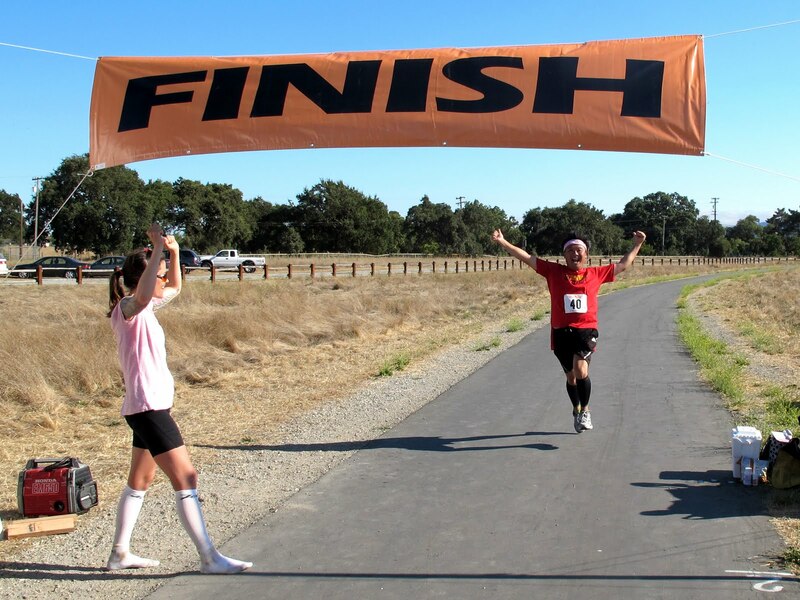 The course is "a fast 2-mile loop in San Martin, CA with the backdrop of hills on the one end and a few homes, with distant mountains behind them on the other." After experiencing the excruciating heat of Hotter Than Hell, the treacherous Lovely Bones fields of Cool Moon, and the killer acorns and twigs of The Dirty Dozen, I was very happy to find a straight forward, no frills, 50k! The morning weather suited me well, as I felt like I was running through Lands End in San Francisco. By mid afternoon, though, the cool overcast sky got kicked out by Mr. Sunshine, who radiated pretty hard. It got really warm really fast, but nothing like last weekend's race around the goose turd infested lake. I got through the heat by splashing ice cold water on my head after every loop. 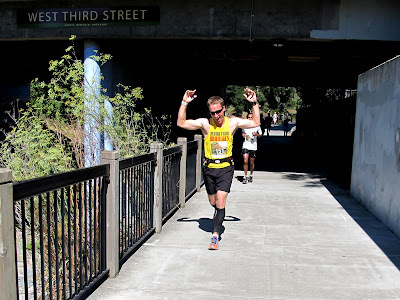 I hit the wall at mile 18, but because of this loop course, I got a lot of inspiration and mental help from my fellow runners, who quickly got me back on track. Early morning shot. Love the overcast sky. That yellow dot in the middle of the road is Guinness World Record Holder, the Walking Diva herself, Yolanda Holder. A race wouldn't be a race without Mad Hatter Fancy Pants! Notice the slight modification to his jester uniform. Two awesome people: Cadillac Steve and Diane. Diane, by the way, saved me in Tahoe. At mile 18 at that marathon, she saw me on the side of the road throwing up. The altitude got to me. Diane gave me meds and ginger candy and instantly revived me! It was good to see her at this race. I really wanted to stow away in Fred's camelback, but he didn't have one! There's Yen Nguyen. When I first saw her name on the participant list of another race, I thought it was my mom! Yen's husband brought me a banh mi (Vietnamese sandwich), which really hit the spot at mile 14! And the sun came up! Blue skies! That banh mi really hit the spot! Here I am with two fellow Marathon Maniacs, Valerie Hower and Bill McCarty. Valerie was the overall female winner for the 50 miler! Here I am with the awesome Rajeev Patel, Mr. Race Director Extraordinaire! Another very unique aspect of Run-de-Vous was the opportunity to "celebrate a loved one." Rajeev set up a "wall of love" for runners to pay tribute to those who have touched our lives. There's so many people who have inspired and motivated me, but after completing this 50k, I realized who it is that I want on that wall of love: Yolanda Holder. I always talk about this Walking Diva, but I'd really like to take this time to pay tribute to this amazing person. It was at the 2009 Rock 'N' Roll Mardi Gras Marathon that I met Yolanda on the shuttle to the airport. Yolanda saw how fixated I was on my medal and so she struck up a conversation with me. She asked if this was my first marathon and I responded it was my fifth half marathon, but it sure felt like the first time all over again. I told her that I was training for my first full marathon, which would happen in my hometown of San Francisco. Yolanda then told me her story and I was blown away. She explained that she was a Marathon Maniac pursuing the world record of most marathons completed in one calendar year. I thought it was 10 or so, but when she said it was 101, I nearly fell off my chair! I asked Yolanda what a Marathon Maniac was and she gave me the low down. In my mind, I thought this woman was nuts! I could not fathom running so many marathons! I also could not believe that there was a club like this! Yolanda mesmerized me to the point where I just couldn't stop listening and asking questions. When I finally felt comfortable enough to confide in her, I admitted that I was so self-conscious and worried about not fitting into the "mold" of the runner. Her response to me: "This is your journey. Do it your way." Indeed I have, and two years later, I am a Marathon Maniac with 32 marathons and 40 half marathons under my endorphin cape. Yolanda is not just an inspiration to me. This Walking Diva is the one who ignited that maniacal fire in my heart, and for this, she is plastered all over that Run-de-Vous wall of love! I am very happy I came out for Run-de-Vous. Not only did I complete my 32nd life time ultra/marathon, but I also scored a huge 10 minute PR. My previous personal best was at Rajeev's Ruther Anderson race. I guess I'm just going to have to run more of his races! Titanium Scoreboard: 25 down, 27 to go! My plans to run a 50k/marathon ultra double this weekend got foiled when the warning light on my car went off. Better safe than sorry (or dead! ), I turned around and headed back home. Not all was lost because I got a recovery 5k in today with my running club! When I read the course description, I thought to myself, "sweet, easy race after a pretty brutal 50k." Boy, was I wrong. This was one hilly 5k! I ended up walking this 3.1 miler, which was a smart move, as I had quite a few blisters from yesterday on both my feet. I also had a chiweenie with me and walking partner who wore jeans. Who wears jeans to a 5k? I ask again, who wears jeans to a 5k? Damn blisters. Please just pick me up and take me to the finish line! Chris Bliss, the woman in the jeans, is going to spike my Cytomax if I don't give an explanation for the denim. What happened was that she wasn't expecting to do this race, so she had not done any laundry. I talked her into coming with me and Ultra Woof, since I wasn't running my SoCal marathon. Miss Bliss threw on the jeans expecting to volunteer at the registration desk. However, when we got there, the race directors had everything under control, so she ended up walking the 5k. In jeans. Everyone was so confused by "That Woman In Jeans." Well, I just set the record straight! So I didn't get to run my ultra marathon double, no big deal. I got to do something a lot better: I got to be with my DSE family. On a final note, I do have to say that my archrival, that 5 year old boy, beat me again! Not sure what I have to do, but this is definitely beginning to affect my psyche. I think it's time to find a sports psychologist. My archrival with my dog. After crossing the finish line of the Salinas Half Marathon, I had to drive 300 miles south to get to the second half of my west coast non-Disney Goofy Challenge. Running 39.3 miles in one weekend doesn't phase me, it's all the traveling that kills me! Thankfully, I had two Endorphin Dudettes who helped me reach my weekend goal. Chris Bliss chauffeured me around and fellow Half Fanatic Elizabeth McKay graciously hosted us at her quaint smurf-like cabin in Lake Elsinore. Chris Bliss and I arrived at Elizabeth's cottage by the lake at around 10pm Saturday night. The distance from her place to the start line is about one hour. 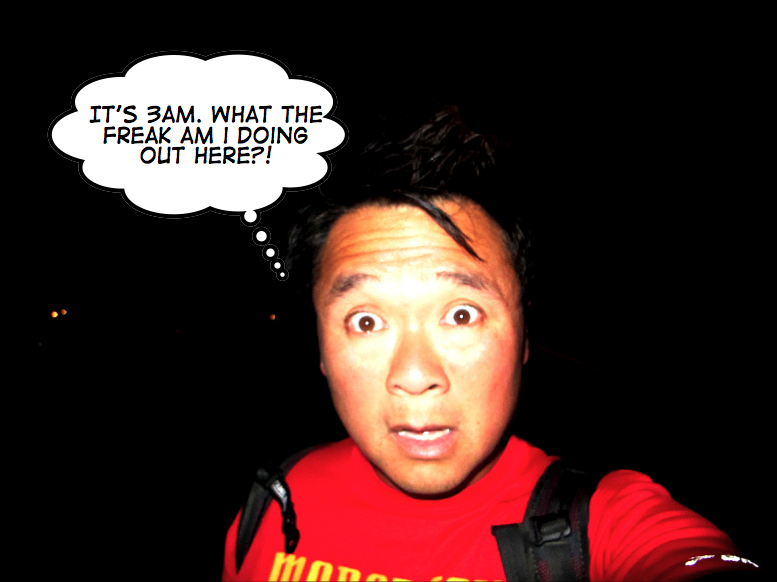 That meant that in order for me to have my 3am start, I had to leave at 2am. I couldn't get to sleep until midnight. You do the math. Let's just say that there was a serious endorphin deficit at that hour! Fortunately, there were others who took the early start, so I had company out there. Runners started to trickle in by 4am and by 7am, everyone showed up. It was so nice to see people in daylight! This marathon was a no frills kind of race. We ran a paved bike path with a slight elevation climb, two loops for the half marathon and 4 loops for the full. I like these looping races because I get to see other runners multiple times on the course. It helped my ego that I finished way ahead of the elites in the pack. I figured out the sure fire way to beat the Ryan Halls, Kara Gouchers, and Mebs or the world: start four hours early! At the end of the day, it took me over 7 hours to finish this race. The good news is that I scored my first negative split in a long time. Running in the dark by myself slowed me down, but having people around in broad daylight sped me up! I am very happy to get marathon #30 done! Thank good Jessica Wabbitz and Mrs. Mad Hatter Fancy Pants showed up. These two, along with MHFP offspring Eden, helped me get my negative split! A marathon wouldn't be a marathon without Mad Hatter Fancy Pants! Jo Jo Starbucks got there before I did! He started at 2:30am! Jessica Wabbitz sans bunny ears, Mrs. Mad Hatter Fancy Pants, and the Mad Hatter offspring Eden. What a colorful bunch! Here's fellow Marathon Maniac, Yen Nguyen. That's my mom's name! When I saw her name on the roster, I immediately thought, "WHOA! My mom is running a marathon?!" Yen is organizing a marathon in Vietnam. I'm so there! What an endorphin filled weekend. On Saturday I ran my 40th half marathon. Today I ran my 30th marathon. Life is good! Titanium Scoreboard: 23 down, 29 to go!